(Nanowerk News) An international team of astronomers discovered 83 quasars powered by supermassive black holes in the distant universe when it was only around a billion years old (The Astrophysical Journal, "Subaru High-z Exploration of Low-luminosity Quasars (SHELLQs). V. Quasar Luminosity Function and Contribution to Cosmic Reionization at z = 6"). This finding increases the number of such black holes known at that epoch considerably and reveals for the first time how common they were early in the universe’s history. When you look up at the night sky, every point of light you see is a star within our galaxy. But with powerful telescopes, you can see far beyond our own galaxy and gaze upon others. 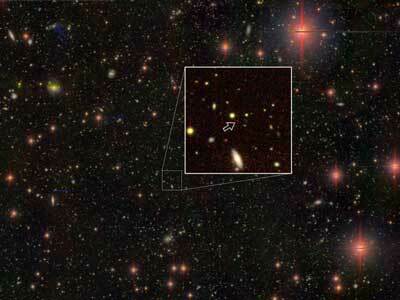 The farther away a galaxy is, the older it is due to the time it takes its light to reach us. Astronomers have long exploited this fact to learn about the early universe. UTokyo Professor Nobunari Kashikawa and an international team of astronomers recently peered far back into the early universe to explore the origins of some of the strangest and most energetic objects known to science - quasars. These quasi-stellar objects are galactic cores that expel vast amounts of energy across the electromagnetic spectrum. They outshine our own galaxy a thousandfold and are powered by supermassive black holes millions to billions the mass of our sun. While quasars are prevalent nowadays, it’s unclear when they first appeared and how many of them existed in the distant early universe. To investigate, Kashikawa and team used the giant Subaru Telescope in Hawaii to peer at a patch of sky about 100 square degrees in size. The main single-mirror of the Subaru Telescope is the largest in the world, equal to those of the Very Large Telescopes in Chile. This is important to allow as much light in as possible in order to reach the sensitive instruments at its focal point. For this survey, the astronomers used the Hyper Suprime-Cam, a supersize digital still camera, which uses an 870-megapixel sensor to resolve great detail from the light gathered by the main mirror. To put things in perspective, the camera in a high-end smartphone at the time of writing may have around 20 megapixels. Kashikawa and team took photos of over a hundred possible candidate galaxies from a time when the universe was only about one tenth its current age of 13.8 billion years. From this list, they confirmed that 83 were in fact quasars, which demonstrates they were far more common in that era than was previously thought. Results such as this can help astrophysicists piece together the cosmic puzzle and learn more about how it all came to be.